Officers from the French police have arrived at the Surrey home of the family who were shot dead while on holiday in the French Alps earlier this week. British and French police officers (identities not known) talk outside the home of French shooting victim, Saad al-Hilli in Claygate, Surrey. THE SENIOR POLICE officer leading a team of investigators in Britain following the deadly shooting of a British family in the French Alps said today he expected a “long and complex” probe. 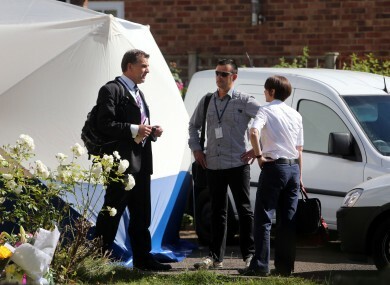 Two of Colonel Marc de Tarle’s officers earlier visited the home of the Al-Hilli family in the village of Claygate in Surrey, a commuter village some 15 miles southwest of London, as British forensics teams began searching the house. Saad al-Hilli, a 50-year-old naturalised Briton born in Iraq, his wife Ikbal and his 74-year-old mother-in-law gunned down as they sat in their car in a forest car park in an Alpine tourist area. Their seven-year-old daughter Zainab was left for dead and remains in a medically induced coma after being shot and badly beaten in the attack. Zeena hid undetected for eight hours under her dead mother’s skirts and escaped physically unscathed. Speaking outside Woking police station in Surrey, De Tarle said he was pleased with the assistance he was getting from the British police. “We are here within the framework of a request for international mutual help launched by the French judicial authorities towards the British authorities,” he told reporters. “The cooperation is working well and the British police are putting in place all necessary means on a human and a technical level. Our visit here has been assisted by the French embassy. Surrey Police assistant chief constable Rob Price, the head of operations at the county force, added: “This is a French-led investigation. Surrey police will do all we can in support of the investigation on behalf of our French colleagues. “Throughout that support, I want to place the emphasis on the victims of this tragic incident and Surrey police, again, with our French colleagues, are ensuring that all those who need support will get the support. Email “Alps shooting: Police say investigation will be 'long and complex'”. Feedback on “Alps shooting: Police say investigation will be 'long and complex'”.